THIS IS A NICE TRAILER AT A GREAT PRICE! 80000 LB FRAME CAPY. IN 20 FT. THE TIRES ARE ALL GOOD, THERE ARE SOME BROKEN-WEATHERED BOARDS, SOME SURFACE RUST, PAINT PEEL, CHIPS, SCRATCHES, DINGS ETC. THE CONTENTS ON THE TRAILER ARE NOT INCLUDED. WE USE IT DAILY BUT ARE UPGRADING OUR FLEET. 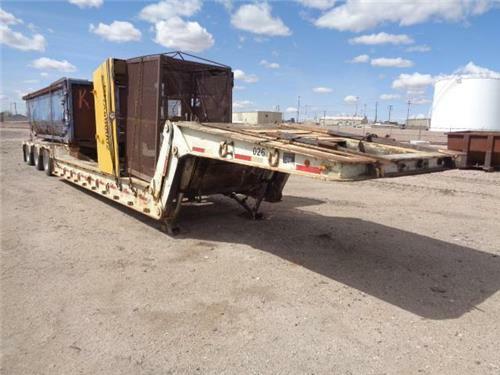 THESE RAILROAD EQUIPMENT TRAILERS ARE HARD TO FIND SO DONT MISS OUT.--LOCATED IN ALLIANCE NE, BUT WILL BE MOVING TO SIDNEY NE. SOON.